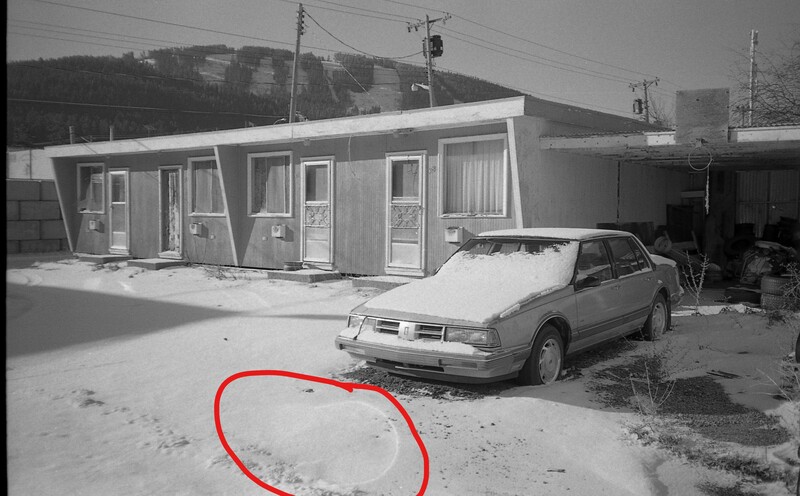 What are these circular splotches on my negatives? then off to the scanner the next day (V500 flatbed) for scanning. There are some weird effects going on however in most of the frames, as well as the usual pixelated look I've grown accustomed to with flatbed scanning 35mm. I am wondering what this is and how I can fix it. Using distilled water maybe? 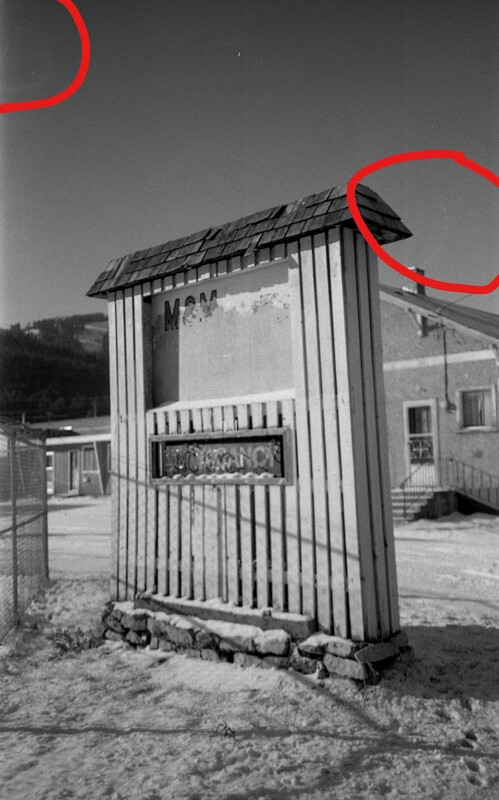 The one you've noticed is water spots remaining on the negatives when the film has been hung to dry. Re-washing and drying may help. It may not remedy the problem if the emulsion side of the film is affected. After the fixer bath, wash longer than you have been to get rid of ALL the fixer that has been absorbed by the emulsion. Always strive to keep all the liquids at the same temperature to avoid stressing the emulsion which has absorbed the processing solutions. The swollen emulsion is fragile. Instead of plain water, a 30 second acid stop bath accomplishes three things: The change in pH from base to acid will put the breaks on the developer almost immediately to ensure correct development times. It will help to preserve the fixer from being diluted by the residual high pH carried into the fix from the developer. AND the change in pH will help compress the swollen emulsion to "squeeze" more of the developer out of the emulsion faster than plain water. Washing longer allows all the fixer to migrate from inside the emulsion into the wash water. This takes time. 20 to 30 minutes is minimal. Archival wash is more like an hour unless you use Hypo (fixer) Eliminator. Ensure the wash water temperature is the same as your other solutions (20°C - 68°F optimal) and does not fluctuate. A quick dip into diluted (according to instructions - more is not better) wetting agent will lessen the possibility for drops to form on the film surface. Wash a minute or two more to remove the wetting agent and you can hang the film in a clean, dust free place to dry. Remember that the chemicals work in the emulsion not only on the surface of it. Your second problem is the scratches on the film emulsion from squeegee-ing the film to get rid of the water. One more thing™ The total time in the fixer should be "twice the time the film takes to clear." This "time" can be determined experimentally by immersing an unprocessed chip of film in the fixer and carefully time how long it takes to become transparent. Double this time is the correct length of time for the fixer bath. Longer than this time is not necessary or helpful. A short final wash in distilled water with a wetting agent is always a good practice. Consider Ilford Ilfotol or Tetenal Mirasol or something of the like. Distilled water in development and fixing is not as crucial as in the final wash - unless your tap water is especially hard it should have little effect. The D76 by Kodak is a tolerant soup (if you mix your own, which is very exciting but perhaps not ideal for starters, it would be a different matter). Most probably they are just calcium deposits from the (hard) water you used in the wash cycle when developing the negatives. You can use distilled water, you can get it by using on your inserting a filtering equipment that use carbon filters and a descaling agent on your tap water, it will pay itself for if you plan to develop regularly, but if you simply only plan to develop occasionally you will better off buying distilled water (i.e. low mineralization drinkable water from your grocery store, the cheap one) by the gallon. Using a wetting agent will help in the meantime, but be aware they don’t usually have a descaling agent, they are usually made of soap that doesn’t have the additives used in current soap formulations to artificially create bubbles. If you have a “good water source” it’ll only help to reduce the wash time... even if most of them claim to have anti static properties, if you let your film hang to dry in a place with airborne dust you will get dust on the negative no matter if you use wetting agent or not. There are no magic formulas but some common sense... many film developers have built their own rituals that make them feel better but most of them aren’t scientifically based. Not the answer you're looking for? Browse other questions tagged film black-and-white developing kodak or ask your own question. How do I develop black and white negatives at home? How to proceed after having developed the negatives? What do properly developed negatives look like? What caused these strange patches on developed film negatives?